The antique brass compass General Dempsey keeps on his desk, given to him by his Aide-de-Camp, LCDR Mike Wisecup. Martin Dempsey, retired United States Army general who served as the 18th Chairman of the Joint Chiefs of Staff, writes about leadership and finding the right path. In writing about leadership, I’ve described some of the things I keep on my desk to remind me what’s really important: a walnut box filled with the pictures of my fallen Soldiers engraved “Make It Matter,” a 4-inch tall crystal angel holding a gold star given to me by a young girl who lost her Marine father, a framed dollar bill I exchanged with SGM Bernie Henderson in 1974 as an expression of my commitment to earn the trust of the soldiers I would soon lead. I also have a moral compass. 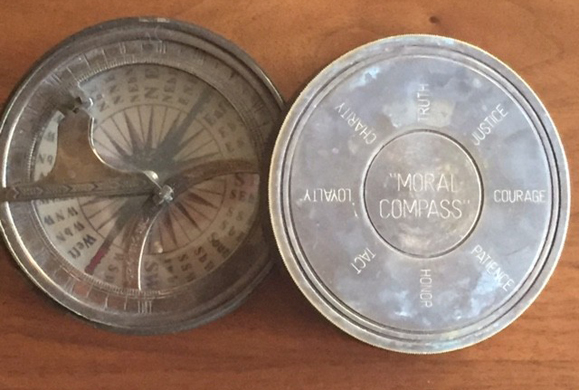 Well, actually I have an antique brass compass engraved with the words “Moral Compass.” It was given to me eighteen months into my time as Chairman of the Joint Chiefs of Staff by one of my aides-de-camp. In the military tradition, Generals and Admirals are assigned an aide-de-camp. They are generally responsible for making sure that the General or the Admiral gets where he or she is supposed to be in the right uniform, but they often become a sounding board, confidant, and trusted advisor. I had six during my time as Chairman. Each made me a better Chairman. From September 2011 through December 2012, LCDR Mike Wisecup was my Aide De Camp. Naval Academy graduate, Navy Seal, Olmstead Scholar, tall and athletic, Mike was poised, confident, and inquisitive. Like most aides, he was clearly among the best of his peers. Even as a young officer, Mike could command a room. The Chairman’s social schedule is nearly as packed as his daily meeting schedule, and when Mike accompanied me to frequent social receptions, my Army Blue uniform and 4 stars were no match for his choker white uniform and the Trident insignia of a Navy Seal. Sometimes as people gathered around him, he would catch my eye, grin, and shrug his shoulders. He was quite a character. Mike explained that he had heard me speak often about the importance of leaders having a moral compass, a set of principles to define their “true north” and to guide them when they navigated through difficult and often ambiguous decisions. He said that the most enduring lesson he would take from our time together was the importance of trust in building and sustaining relationships whether with the most junior sailor or the most senior elected official in our government. He said that he had selected the eight attributes around the cover of the compass because based on our time together, he considered them the building blocks of trust. My “moral compass” has been with me ever since. I’ve sometimes thought that I might add or substitute an attribute or two for those currently engraved on it, but in the end I decided that I couldn’t improve on my young sailor’s advice about how to find the right path and stay on it. So here are a few thoughts about each of the attributes engraved on my brass moral compass. Trust: The ultimate goal of leadership and therefore appropriately positioned at the center of the moral compass. Everything we do should contribute to developing trust among leaders and those they lead. Everything we are should reinforce that we are worthy of that trust. Justice: Speaks to the responsibility of the leader to respect the law and to promote fairness. The best leaders demonstrate genuine concern that their actions will be perceived as fair and equitable by those they serve. Courage: On the compass in recognition of the fact that the leader must be willing to do the right thing even at personal risk. That includes leading from the front in conditions of discomfort and danger—physical courage—and making ethical decisions consistent with the values of the organization—moral courage. Patience: Reminds the leader to take time to listen and to value the input of others. Leaders who act precipitously and unpredictably or who value only their own counsel are unlikely to act to the benefit of all. Honor: Encourages the leader to do the right thing for the right reason without expectation of personal recognition or reward. Counsels that the leader’s reputation is their most precious possession. Tact: Calls on the leader to be courteous and respectful and to understand that all of us have things affecting our lives that will affect how and when we make decisions. Loyalty: Provides those we lead with the confidence that we will be there for them when they are vulnerable. Loyalty must work both ways, cannot be blind, and must be earned. Charity: Ensures that the leader remains mindful that there are many others whose lives are more difficult than ours. Charity is leading with compassion and empathy. 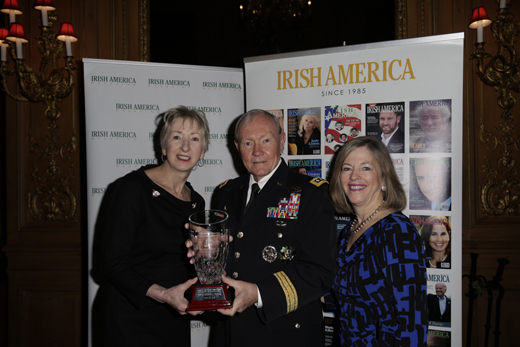 About the Author: After forty-one years in military service, General Martin Dempsey retired as the nation’s highest-ranking military officer. He now lives in North Carolina where he is faculty at Duke University, sits on two nonprofit boards, plays a leadership role in the NBA, serves as chairman of USA Basketball, and develops leaders with Starfish Leadership. General Dempsey is the co-author of the best-selling book, Radical Inclusion: What the Post-9/11 World Should Have Taught Us About Leadership with New York Times bestselling author Ori Brafman.